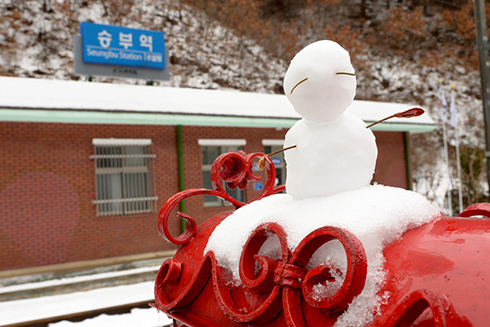 Seungbu Station, a tiny train stop in a small village called Bonghwa in North Gyeongsang Province, is renowned for having the most breathtaking winter scenery in the region. If you're planning on driving there, you'd better leave your car behind and hop on a train at Cheongnyangni Station in eastern Seoul as Seungbu Station sits in a part of Korea that is tough to reach by road. Trains have been ferrying tourists there since 1999 during the winter and offer better views than if traveling by car. "People come here to enjoy nature at its purest due to all the beautiful, untouched scenery, and they get a pleasant surprise as soon as they step off the train," Kim Jin-hee, who manages the train station, said in a heavy Gyeongsang accent. Instead of fancy restaurants and attractions, visitors immediately find themselves surrounded by nature. The area is so quiet that the only sound to be heard at this time of year is that of the snow being crushed under your feet. 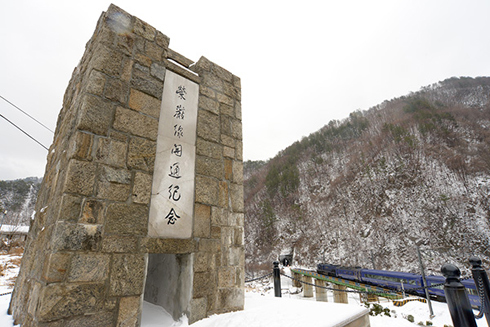 Before long, the frozen Nakdong River comes into view in front of the station, as well as the mountain on the far side of it blanketed in white snow. As such majestic scenery slowly reveals itself, it becomes apparent that Kim was not exaggerating and there's something special about Seungbu Station. A monument from which travelers can enjoy the views of the surrounding scenery is located about 50m from the station. The hill on which it sits also affords a picturesque view of the snow-covered station, especially when trains pass through a tunnel there. 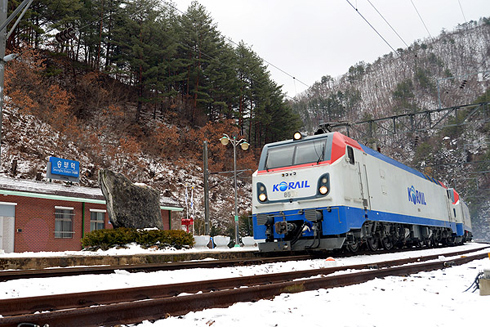 KORAIL runs special trains to Seungbu Station through December and January. For more details, log on to its website (www.korail.com). What Does 2013 Hold for Korean Film?